Because it is not uncommon, as Einstein was well aware of, for official authorities and acclaimed experts to omit, ignore, or even suppress facts (sound scientific evidence). Today, this is a familiar reality across virtually the entire field of science. Both modern medicine as well as non-orthodox alternative medicine with all its many sub divisions, such as the domain of nutritional supplements among the health industry, are no exceptions to this routine practice. Therefore, a proper understanding of nutrition, diets, nutritional supplements, modern medicine, and the so-called healthcare system is inextricably tied to having a good grasp of the political-social context –this includes especially a sound perception of politics. This broader insight is the major reason why "macro-level" information, such as on socioeconomic and political processes, is rather generously included and discussed in this site's content on "micro-level" topics, such the health benefits of vitamin supplements or vitamin toxicity. (Another chief aspect of this rationale is coming up below). We live in an environment in which you are routinely presented with, and exposed to, many different and oftentimes conflicting opinions, rather than facts, about health and nutritional supplements. Frequently, these eclectic opinions are dispensed by a variety of authorities and experts. No surprise so many people are confused about food supplements. Are you mystified about supplements? Who is lying, who is telling the facts about vitamins and health supplements? Why take supplements? Is there any genuine science-based evidence in support of nutritional medicine? How do dietary supplements work? What are the vitamin benefits? What will supplements do for me, or my health issues? Do I really need antioxidants and vitamin supplements for health or is a healthy diet (good nutrition) enough? Are supplements necessary or do they just create “expensive urine”? Are all nutritional supplements created equally? How do I know if a natural health supplement works or if I simply waste my money? What are the side effects of dietary supplements? Are "miracle" weight loss pills actually effective or safe? What are the best diet supplements? Dietary supplements and risks... real or exaggerated? What are the criteria I should look for when I buy dietary supplements? Should I take synthetic vitamin supplements or whole food vitamin supplements? What are the best health supplements to take? Who regulates nutritional supplements, and how? Do the policies of dietary supplement regulation give a guarantee for supplement quality? What is the best time to take vitamins? Why is it that only the allopathic medical profession (the business of conventional medicine) can legally claim to “treat, cure, or prevent diseases” with their treatments? And why are advocates of nutritional supplements, for example, not allowed to claim this about the use of supplements? What are the biggest supplement myths and fallacies? This website addresses (or is going to) all of these issues about nutritional supplements. And much, much more. At this very moment, you're either convinced that nutritional supplements are a total waste of money (and maybe even dangerous), or that they are extremely beneficial and necessary. Or, you likely hold a position that lays somewhere in-between these two points of view. How did you arrive at your current conviction? Whose information helped you form your perspective? Do you believe you most certainly know the facts about dietary supplements? Are you dead set in your thinking, are your attitudes about health supplements “set in stone”? The information on this website might challenge some (or many) of your perceptions about nutritional supplements, nutrition, health, natural medicine, prevailing “official medicine” (traditional allopathy), and the political culture. But challenges carry the seeds of new possibilities, progress, and growth. And oftentimes... a path to the true scientific facts. Because it is not uncommon to find the truth in the things that deeply disturb us, in things that make us uncomfortable. And more often than not, the reason why something is challenging us and is making us uneasy is because it goes against "common knowledge", against the offical views advocated by public health authorities and the medical establishment. Thus, the exposure to "challenging information" –about nutritional supplements, for instance– may lead you (and leave you) onto the side of a rather unappreciated tiny minority. Many dogmatic traditions and dominant organizations, which portray themselves largely as the sole and exclusive authoritative possessors of the truth (the facts) –as in the case of the prominent, “sacred” institution of conventional allopathic medicine (organized medicine)– are representations of culture-specific ideologies. Such ideological perspectives are a direct outcome of, and determined by, both authoritarian governments and other highly influential, rigid groups in positions of power whose origins and battles over turf may go back hundreds or even thousands of years. 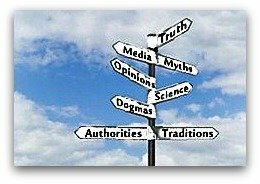 By contemplating new data and by putting new information (or uncommon perspectives) about nutritional supplements, health, and modern medicine against this inflexible-dogmatic, cultural background, it might assist you in viewing knowledge that diverges or contradicts the established authoritarian paradigms, with renewed vigor and openness. When reading the writings on this site you will discover that it is not uncommon to find political elements and socioeconomic contexts discussed among information on nutritional supplements, health, and allied topics. the state or quality of nutrition is based on a varying combination of: the conditions of the environment and individual choice. Whether healthy nutrition or unhealthy nutrition, the foods we eat (our diet), the dietary supplements we take, the water or other beverages we drink, and the air we breathe are principally products of the conditions of the environment. ...the environment is a (extended) part of every person's organism. Just like individual vitamins and minerals inside of you do not operate in a vacuum independent from your “personal body”, your personal body does not operate in a vacuum independent from the “planetary body” (the environment). "For more than a century, analysis of disease patterns has shown that the environment is the primary determinant of the state of general health of a population." Economic systems, the social milieu, and politics affect the conditions or quality of the environment in the most fundamental way possible. Therefore, social, economic, and political factors, conditions, and decisions that are impacting the environment (ecology), are integrally connected to one's own personal health –and its closely associated fields of diet, nutrition, and nutritional supplements. Ultimately, having genuine knowledge about sociological forces and politics, especially in Big Business societies (e.g., the corporate-controlled Westernized nations), empowers you. It allows you to (better) figure out whether the dominating authoritarian culture –with its particular system of economics and climate of politics, with its ideologies, regulations, and popular narratives– is actually constructive to your health or rather destructive (e.g., ponder the quote underneath the headline of this section and an earlier quote by Dr. Linus Pauling). As touched on above, let's not forget that personal responsibility is part of the nutrition equation because nutrition (and “lifestyle”, in a broader sense) is in part directed by individual decision. “If a man will begin with certainties, he shall end in doubts; but if he will be content to begin with doubts, he shall end in certainties. An open but critical, questioning, doubting state of mind practically guarantees that you're always thinking about the things you're exposed to (rather than “blindly” believing the declarations of authorities and experts). It's the frame of mind with a “high probability” of leading you to the truth about nutritional supplements. And anything else for that matter. It's the frame of mind I humbly but strongly suggest you apply when reviewing the information on this website. And... any information on anything else, no matter where. What Is My Intention As An Independent Researcher? Most importantly, my intention as an independent investigator is to provide you with the facts, always. I may, however, not always succeed in uncovering them. Attempting to reveal the truth about nutritional supplements is challenging in a maze of data, which oftentimes is contradictory. After all, alongside unacknowledged and suppressed factual data, there is a lot of information and misinformation –even hype– about supplements, nutrition, and health available. "Today’s grand illusion is of an information age when, in truth, we live in a media age in which incessant corporate propaganda is insidious, contagious, effective and liberal." ...this is my aim, my goal, my intent in my research about dietary supplements, health, and their related themes. I'm dedicated to always seeking, and hopefully finding, the truth. Primarily because nutritional supplements, quintessentially, are all about health. Your health. And mine. Our most precious asset. The best way to protect and maintain our health is with accurate information, the facts. With facts I can be of greatest value to you because by providing actual facts I can help you the most with making your life better. Therefore, your health (and mine) deserves nothing but the truth about nutritional supplements, both good and bad.